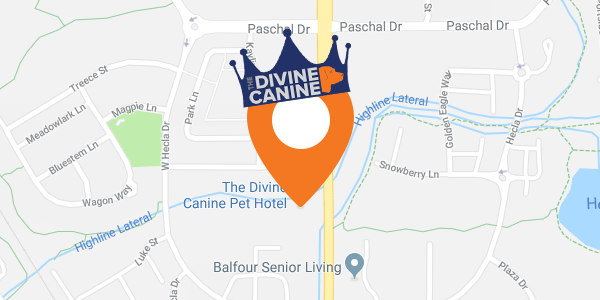 IS DIVINE CANINE LICENSED AND INSURED? Yes! We are fully insured by Travelers Insurance and we are registered with the City of Louisville and the State of Colorado. We are licensed and inspected regularly by the Colorado Department of Agriculture, Division of Animal Industry. We pride ourselves on strict accordance with the Pet Animal Care Facilities Act rules and regulations, including a supervisor to dog ratio of no more than 1:15. WHAT BREEDS ARE ACCEPTED AT DIVINE CANINE? We accept all breeds except purebred pit bulls, per the City of Louisville regulations. All dogs staying with us for grooming, daycare or boarding must be current on rabies, distemper, parvo and bordatella vaccinations. Puppies under 6 months of age are exempt from rabies. AT WHAT AGE CAN PUPPIES ATTEND DIVINE CANINE? Puppies should be at least 12 weeks old, healthy, and vaccinated with distemper and parvo (at least two rounds). Puppies over 6 months should be vaccinated for rabies. WHAT DO I NEED TO BEGIN BOARDING AND DAYCARE? Call Divine Canine at (303) 464-1380 to schedule a Meet and Greet trial day. Complete the New Dog Admission Packet and bring your proof of vaccination with you on that day. All Dogs participating in boarding and daycare at Divine Canine are subject to the terms and conditions of the New Client Service Agreement provided to the client at the trial day. Boarding and daycare clients agree that they have been provided the terms and conditions, have read them thoroughly, and agree to all conditions prior to boarding and daycare. WHAT IS THE MEET AND GREET TRIAL DAY? A Meet and Greet day is an integral and very important step in acclimating each new guest into the group play environment. Our introduction process, which includes a temperament and behavioral assessment, allows us to determine if your dog will benefit from our group play environment. Meet and Greet days are scheduled by appointment and are limited to a small number per day. This allows our staff to work one-on-one with your dog and give them lots of individual attention. Due to high demand and in the interest of maintaining our high levels of safety and customer service, we limit the number of trial days that we perform each week. As a result trial day appointments are usually booked from several days to a week or more in the future. Please take this into consideration when making your appointment! CAN I SCHEDULE BOARDING OR DAYCARE WITHOUT MEET AND GREET TRIAL DAY? Normally, we do require a Meet and Greet day before scheduling any boarding. It is important we meet your dog, make sure they are comfortable with our kennels and staff, and happy in playgroups with other dogs. It is also important to show your dog that you will be picking them up at the end of their stay with us. Please call us to discuss that possibility at (303) 464-1380. CAN I HAVE MY DOG GROOMED WHILE S/HE'S AT DAYCARE OR BEING BOARDED? Absolutely. We offer a quick bath as well as full grooming appointments so your dog is clean and ready to return home. Just make an appointment at the front desk in advance. DO YOU OFFER BOARDING WITHOUT DAYCARE? Generally, our boarding dogs join our daycare dogs in playgroup. We feel the experience of playing is very beneficial to dogs when away from home. It keeps them exercised, and allows them to have company when away from their family. However, we will consider boarding-only on a case-by-case basis for dogs who do not do well in a group setting. These dogs would be walked individually or enjoy outside playtime in large individual areas. Please call us at (303) 803-8450 to discuss your dog’s individual situation. Absolutely. We have large kennels that can accommodate multiple dogs comfortably. DO I NEED TO MAKE ADVANCE RESERVATIONS? Advance reservations are recommended and appreciated but we can often accommodate last minute needs of previous boarders. WHAT ARE THE DROP-OFF AND PICK UP TIMES FOR BOARDING? Monday - Friday: you may drop off your dog between the hours of 7 AM and 6:30 PM. Saturday: you may drop off your dog between the hours of 9 AM and 5 PM. Sunday: you may drop off your dog between the hours of 10 AM and 5 PM. We prefer boarders to be dropped off by 4pm so our guests can enjoy some play time before dinner. Monday - Friday: you may pick up your dog between 7 AM and 6:30 PM. Saturday: you may pick up your dog between the hours of 9 AM and 5 PM. Sunday: you may pick up your dog between the hours of 10 AM and 5 PM. A late fee of $20.00 is applied on boarding pick-ups after 3PM. DO I NEED TO MAKE AN ADVANCE RESERVATION FOR DAYCARE? We do require advance reservations for doggie daycare. Please call ahead to secure your reservation. WHAT IF DAYCARE ISN'T RIGHT FOR MY DOG? Daycare and group play aren’t the right solutions for all dogs. Although we believe most dogs benefit greatly from canine socialization, sometimes there just isn’t a good fit. If that is the case, we will give you our honest assessment of your dog’s behavior and temperament and provide our best advice on socialization and training. DOES DAYCARE HAPPEN IN INCLEMENT WEATHER? Luckily, Colorado enjoys over 300 days of sunshine which our dogs greatly enjoy. All dogs can always access cooled or heated indoor areas but most dogs prefer to play outside. In the event of unusually cold weather, we bring the dogs inside to heated areas to play and ensure they don’t get too cold. WHAT ARE THE DROP-OFF AND PICK UP TIMES FOR DAYCARE? Monday through Friday you may drop off and pick up your dog between the hours of 7 AM and 6:30 PM. On weekends normal drop off and pick up times are 9 AM through 5 PM on Saturday and 10 AM through 5 PM on Sunday. HOW FREQUENTLY SHOULD I GET MY DOG GROOMED? Unless your dog has gotten into something smelly or dirty, s/he will need to be groomed every four to six weeks to maintain a great appearance. Bathing too frequently will dry out their skin and strip the natural oils from the coat. Grooming a dog infrequently can mask a dog’s skin and coat issues and lead to dematting, shaving and other extra grooming charges, but most importantly an unhappy dog. WHEN ARE GROOMING APPOINTMENTS AVAILABLE? We have grooming appointments available 7 days a week. AT WHAT AGE SHOULD I START GETTING MY PUPPY GROOMED? Ideally you should acquaint your puppy with bathing and nail trimming very early in their life—around 4 months is a good starting point. This ensures that they become lifelong friends with the grooming process and enjoy their routine spa days. WHAT IF MY DOG IS AFRAID OF GROOMING? Our groomers are very experienced at handling dogs and are very kind, loving and gentle. If a dog is frightened they use multiple techniques to earn their trust and may alter services to best meet the needs of your pet. In rare circumstances they may advise the use of veterinary services to sedate your pet. We do not sedate pets at Divine Canine. HOW LONG DOES IT TAKE FOR MY DOG TO BE GROOMED? Count on up to three hours for your pet to be thoroughly bathed, brushed and groomed. It may take less time and we will call you when your pet is ready for pickup. © 2019 The Divine Canine. All Rights Reserved.